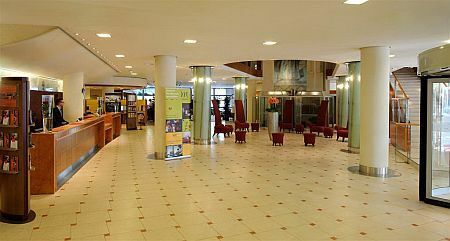 Mercure Budapest Korona is situated in the heart of Budapest, opposite the National Museum, with easy access to cultural and tourist attractions. It's about 5 minute walk to the river Danube. Mercure Budapest Korona has 421 sound-proof rooms with air-conditioning, bathroom, colour TV with satellite channels, Pay video-programmes, phone, safe, electronic security key system, PC-connection and minibar. There are 244 rooms for non-smoking guests. Restaurant Tokaj: offering Hungarian and international specialities, weekdays business lunch (lunch buffet) for businessmen, with piano-violin music in the evenings. Bridge Café: connects the two parts of the hotel with an exciting view of the busiest square in the City and the Kecskeméti utca. Offers coffee and confectionary specialities. The Lobby Bar of Mercure Korona is welcoming the guests with a wide range of cocktails in the piano bar. Protected pay-parking facilities for 130 cars, indoor swimming pool, free entrance tickets to the casinos near the hotel. Mercure Korona has 10 rooms with a max. capacity of 10-110 people. The restaurant is perfect for organizing receptions, company and other functions. In order to guarantee your reservation for arrival after 2pm please inform us of your credit card details and expiry date. Without credit card details the reservation is on non-guaranteed basis. Cancellation policy: Modification or cancellation is accepted until 2pm hotel local time on the date of arrival without any charge. Beyond that time 1 room night will be charged. Send newsletter about the offers of the hotel.